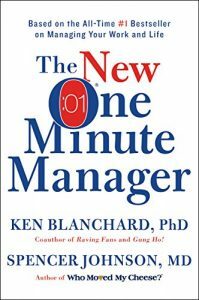 The One Minute Manager is a quick read on how to maximize time and employee’s morale in the most time-efficient way possible. The One Minute Manager is based on the idea that it’s not easy to manage a busy schedule and keep employees happy and motivated. The One Minute Manager wants to help managers manage both: make employees happier in less time. At the end of the spectrum there are two type of managers who get it wrong. Define goals with your employees that are each of 250 words or less. When you define goals so clearly and briefly you can review them in one minute or less. You also need to keep the total number of goals manageable, or you might end up with too many goals to keep track of. One easy way of doing just that is to focus on the 20% of tasks that will give you 80% of results (Pareto principle). Most managers give feedback only when something is wrong. This creates the wrong impression and can genera unneeded resentment and anger. Instead, give a quick praise -“one minute praise”- immediately after the employee has done something well. Employees feel that you care about their work and contribution. It encourages them to keep up the hard work. Employees see that someone cares about their work, and the positive reinforcement pushes to do and deliver better and better work. Similarly as immediate feedback, if something is not done or delivered to your satisfaction, you should let the employee know right away. Give criticism that is fair and precise as soon as you see work that is sub-par. Ken Blanchard says that the key to give criticism that does not poison relationships is to give the negative feedback while still communication that, overall, you still value the employee’s work and contribution. You do it by giving the criticism fair and square and then adding that they are valuable employees and they’re doing well in other fields. One minute criticism are effective because the employee feel that they are being reviewed fairly and timely. The author recommends that before giving one minute feedback you let the employees know they will be reviewed. if you don’t, they might feel like you are spying on them. My Note: I don’t fully agree here. As a manager your role is to look on their performance. To me, it feels much more invasive is someone would tell me “now I’m going to review you”. Much better is to go about your life and then simply notice and catch good or poor performance alike. The biggest takeaway for me is to give the criticism right away. If you don’t, you are basically allowing passive aggressiveness to poison your life. You will grow resentment while the other person has no idea way. On the workplace, that might lead to fire someone while the person had no idea they were doing a poor job. And that’s how workplaces can turn toxic without even anyone having any bad intentions. It’s true what the author say: many do not communicate their appreciation. And that’s all goodwill that is lost. I disagree with the idea that you should let employee know beforehand that you will evaluate them. One because telling someone you will evaluate them can cause tension and mistakes out of nervousness. And two, it feels very micro-managing to me and akin to a power move. A bit as if to say “watch out, I’m watching you now”. The advice is very very good. Easy to implement, clear and very effective. Thumbs up, great. Many books could take a leaf out of The One Minute Manager. Clarity and simplicity make the message stronger. I was a bit put off by the tile thinking that was a marketing ploy for rehashed information. Instead, while it might not break any new ground, it focuses on simple and yet key advice that manager would do very well to listen. And not only manager, we could all learn and gain hugely in giving prompt and clear praise and criticism.